﻿Today's Calendar Date Info, Holidays, Happenings and news. 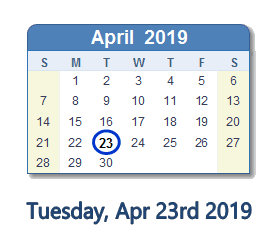 Tuesday April 23, 2019 : 113th day of the year. There are then 252 days left in 2019.
on the 17th week of 2019 (using US standard week number calculation).